Kaplan lives in London and works as a surgeon for the UK’s National Health Service, though remains on stand-by to go to war zones. He is also the author of two books, The Dressing Station (2001) and Contact Wounds (2007), in which he gives an honest and often shocking account of conducting surgery in extreme and primitive conditions. Previous winners of the Robert Burns Humanitarian Award include Nobel Laureate Sir John Sulston who played a central role in the human genome sequencing project and Archbishop Pius Ncube of Bulawayo, Zimbabwe, a human rights activist and outspoken critic of the Mugabe government. he prize went to The Dressing Station: A Surgeon’s Odyssey by Jonathan Kaplan, published by Picador. 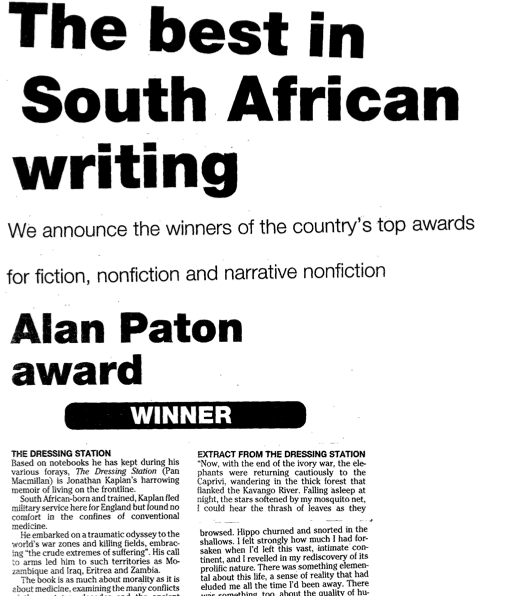 The Dressing Station also won the Alan Paton Award in July.The Book Data/SAPnet Booksellers’ Choice Award goes to the book that “booksellers most enjoyed reading, promoting and selling”, and is worth R50 000. Members of the South African Booksellers’ Association nominate and vote for the books up for the prize.